Clarion, the leading manufacturer of high-performance in-car info-entertainment systems, has revealed its new 7? touch and voice-enabled iPhone dashboard controller called the Next Gate. 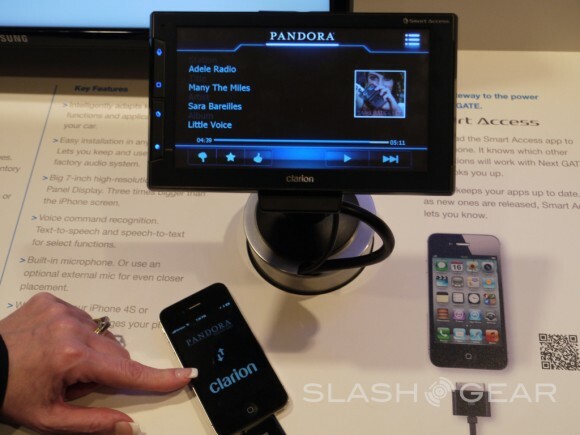 Folks over at Slash Gear have already got their hands on Clarion’s latest in-car entertainment system at CTIA 2012 event and have rated the new iPhone companion as “pretty accurate”. The display is 480×800 in resolution which converts all your favorite iOS apps to a convenient and easy to use car-friendly user interface with initial support for 15 or so applications including Pandora Radio, Odyssey Navigation, Facebook4car (FB4Car) and Vlingo. Calling the Clarion Next Gate an iPhone companion is pretty accurate. The system is pretty much inactive until it’s connected to an iPhone and then it comes to life. Once connected it uses iOS apps and programs to bring you all the entertainment you’d like — all while being safe of course. Once connected the iPhone becomes useless, as a cautionary measure, and everything is handled on the Clarion Next Gate and its smart access system. With a 7-inch Capacitive touch display users can control everything with the touchscreen, although it’s recommended to use voice actions such as Apple’s Siri. You can launch Pandora Radio, make a call, or speak with Siri all with the touch of a button, but obviously you’ll want to use voice-actions as much as possible for your safety as well as other drivers. Clarion expects to launch the product in early June for US $269.